POC™500 is an open-cell spray foam. It is extremely economical and can hugely reduce the amount of unmanaged moisture and air infiltration. POC™500 is applied using a spray gun. It is applied as a liquid and within seconds. It expands to 150 times its liquid volume. The foam is sprayed directly onto the substrate which forms a permanent seal over the most difficult shapes in a seamless fashion. This seal increases energy efficiency and dramatically improves the quality of air indoors by eliminating the movement of air through walls. The performance of POC™500 will be consistent throughout the lifetime of the building. In order to meet building code requirements, POC™500 has been put through extensive testing to ensure its non-toxic nature. It has been developed with the environment in mind and as a result, no toxins are emitted after installation. The foam insulation industry and the benefits of foam insulation are growing every day - especially with the increasing impact of green building, heating and cooling costs, and the rise of fuel prices. There is a new, slightly different foam insulation formulation that is growing in popularity due to budget restrictions or more difficult residential and commercial insulation jobs. It is called Injection Foam Insulation, or sometimes referred to as Pour-in-Place Foam Insulation. This Injection Foam method allows the consumer to benefit from foam insulation that is injected through a hole into the wall cavity, as opposed to being sprayed directly into open wall/stud cavities (new construction). In open cell spray foam air is allowed to slowly flow through the cells for better ventilation, it is permeable; able to 'breathe'. This type spray foam is used where ventilated insulation is required, allowing vapour to escape yet minimising wind movement when expands up to 200 times the size when applied to an area. This particular type of injection foam is delivered through small holes that have been drilled through the interior or exterior of the building. The foam is simply injected through the small holes in a liquid state and it flows down the wall cavity to the floor. Then a reaction will take place and the liquid will begin to expand, rising and filling the entire area of the wall cavity. This style of insulating can be extremely helpful as it can be used for certain jobs where regular spray foam is no practical. The entire process can be carried out without the removal of any existing interior or exterior walls. It offers excellent acoustic properties and is a good type insulation for soundproofing and noise reduction. 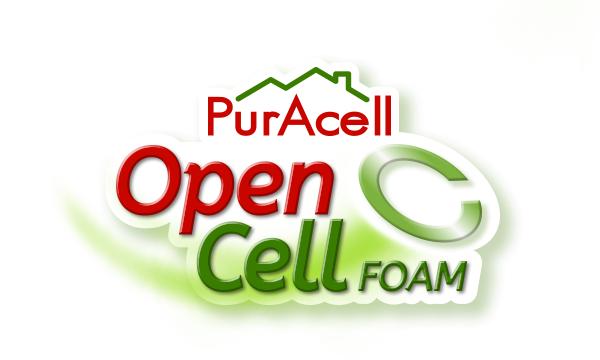 Open cell foam is a quality thermal insulation that will not sag or rot and needs no maintenance.